Many clubs will require that the racecar be equipped with tow hooks. The purpose of this is to make towing easier should you and the car go off the track. Many tracks have gravel traps to stop vehicles if they should go off the track. The great thing about these gravel traps are the safety and reduced damage risks they offer, as it certainly beats hitting a wall. One minor negative aspect is that the car can become a bit buried in the gravel, making it very difficult to obtain access to the factory tow hooks. In all areas, tow hooks can also make the towing process much safer, quicker and smoother. I personally recommend that you use a soft tow hook that comes in the form of a strap. All it takes is a little creativity and an inexpensive tow strap that can be bought for under $20 from a department or auto parts store. When purchasing the tow strap, you should look for one that is “flat” with sewn loops versus a rope-style with metal hooks. Some race shops also sell soft tow hooks which are fitted with ends that can be bolted to the frame of your car. Whatever method you use, be sure that it’s secure. The first time a tow truck secured their tow line to my tow hook, I was a little nervous it would hold and the car would quickly roll off the inclined tow bed. After that, I made sure to double ensure they were totally secure. 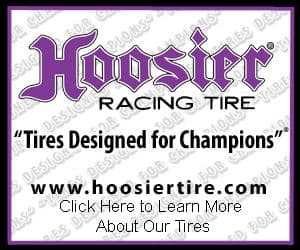 If you are like most racers, by this point you are just dying to buy one or two go-fast parts. If you guessed that when I mentioned this is a go-fast part that it is not necessary at this point in your racecar’s development, you are correct. But if you must, go ahead and purchase an air intake system. This modification can slightly increase the car’s performance (horsepower and torque). How much of a gain varies greatly depending on make and model of the air intake system. The cost for this little goodie is approximately $170 – $200. For now, keep this simple and stock. If you really want it to sound “cool,” put a cheap louder muffler on. One inexpensive modification that can be worthwhile is to remove the catalytic converter. This emissions device does restrict air flow and can be replaced fairly easily with a straight piece of exhaust tubing. Yes, you can do this modification yourself, purchasing all of the necessary parts at your local auto parts store. Before you modify the muffler, be aware that most tracks limit the noise decibel levels, so don’t go too loud with it. If you go too loud, you may not be allowed out on the track. Louder does not mean faster. Your car’s engine is another item that you should keep stock for now, even if it has a significant amount of miles on it. When I started racing my car, it had over 178,000 miles on the stock engine. Building a race engine is expensive and is not necessary at this point in your racing career. As you can see in this section, there are many other areas that you need to spend money on first. Especially on front wheel drive cars, the tendency is for the car to under-steer (won’t turn sharply enough, thus “plow”). One way of correcting this problem is by installing a heavy duty rear anti-sway bar. 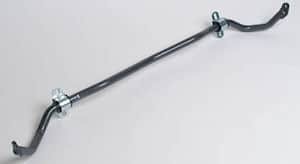 Anti-sway bars are simply rods of solid steel mounted to the vehicle’s frame and held in place by urethane bushings. How does it work? The anti-sway bar absorbs the torsion force exerted upon the car’s chassis. If you obtain a heavy duty rear anti-sway bar, it will reduce the amount of under-steer. In my personal situation, I did not drive the car with the new race suspension before changing the anti-sway bar. I simply made the assumption, based on other people’s recommendations, that a large rear anti-sway bar was needed. When I drove on the track, I had a significant amount of over-steer (rear end coming loose). After further testing and having other experienced racers drive the car, I took the aftermarket anti-sway bar off and reinstalled the factory unit with urethane bushings bought from the parts store for $10. Granted, it was necessary to trim the bushings down a bit with a razor to get them to fit, but in the end it fits my needs very nicely. The aftermarket anti-sway bar continues to lie on the bottom of my basement floor. The moral of this story is, first try driving the racecar, and then determine what handling improvements will be most beneficial. If you do find that a larger rear anti-sway bar is needed for your car, it can normally be bought for between $150 and $200. Radiator coolant: When refilling the radiator, only use a small amount of coolant and not the typical 50/50 ratio. Some clubs won’t even allow racecars to have coolant in the racecars due to the slippery conditions it can create on the track. If you don’t put coolant in the car, be sure to add some if the temperatures start to approach below freezing, and add water pump lubricant to prevent damage. During the racecar build process, there will be some other miscellaneous items that need to be completed such as removing the steering wheel lock, inactivating the air bags (if equipped), taping exposed lights on the outside of the car, inactivating ABS (if equipped), and possibly installing a fuel test port. (The purpose of a fuel test port is to allow inspectors verify that competitors are not utilizing illegal substances in the gas that provides performance advantages.) Since many of the items that you need are club and/or model specific, seek recommendations from other people who drive similar cars. Don’t forget that you will need club decals, vinyl numbers, and vinyl lettering.